Ian Robertson Underwood (born May 22, 1939) is a woodwind and keyboards player, perhaps best known for his work with Frank Zappa and the Mothers of Invention. Underwood graduated from The Choate School in 1957 and Yale University with a bachelor's degree in composition in 1961 and a master's degree in composition at UC Berkeley in 1966. He began his career by playing San Francisco Bay Area coffeehouses and bars with his improvisational group, the Jazz Mice, in the mid 1960s before he became a member of Frank Zappa and the Mothers of Invention in 1967 for their third studio album, We're Only in It for the Money. He speaks on Uncle Meat; on the track "Ian Underwood Whips It Out" he relates how he first met Zappa and demonstrated his capabilities on the saxophone at Zappa's invitation. Underwood later worked with Frank Zappa on his solo recordings, most notably on 1969's Hot Rats. He married Ruth Komanoff (Underwood), marimbist/percussionist from the Mothers of Invention in May 1969. Underwood left the Mothers of Invention in September 1973. He and Ruth divorced in 1986. After his lengthy career with Frank Zappa, he pursued a career as a session keyboardist. Underwood has since been proficient on the Minimoog synthesizer, mostly in film. He has been credited in recordings for Quincy Jones, Barbra Streisand, Ronee Blakley, Hugh Cornwell, Freddie Hubbard, Jean-Luc Ponty, Herb Alpert, Hugh Masekela, Peggy Lee, Dolly Parton, Chicago, Janet Jackson, Dave Grusin, Jefferson Airplane, Frankie Valli, the Carpenters, James Ingram, and Barry Manilow. 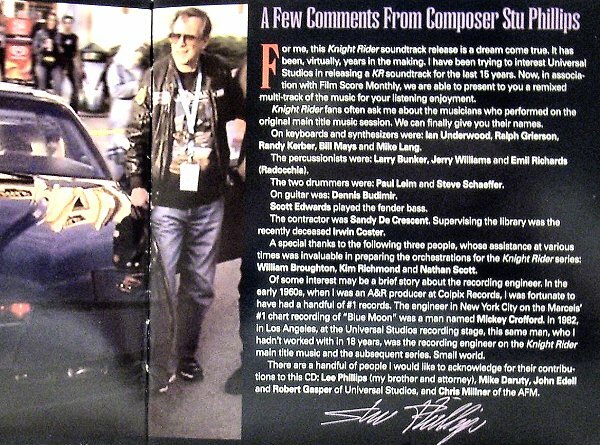 Underwood was also one of the musicians who played the main title theme for the 1980s hit series Knight Rider. Underwood was the uncredited producer of the debut album by Alice Cooper, Pretties For You, in 1969. Underwood has also been a featured performer (mostly on keyboard) with James Horner on numerous James Horner film scores including Titanic (1997) and Sneakers (1992). ^ Huey, Steve. "Hot Rats: Review". Allmusic. Retrieved December 22, 2010. ^ "Ian Underwood filmography". IMDB. Retrieved October 19, 2017. ^ "45 YEARS AGO: Alice Cooper Show Glimpse Of Future On Second Album Amid Commercial Indifference". ultimateclassic rock. Retrieved October 19, 2017.